It’s the height of the holidays. You have big plans with roasted meats, glazed vegetables, sugar cookies and (heavily) spiked eggnog. You likely have a few guests staying with you, and between skiing, card games, sipping mulled wine and oogling Christmas lights, you probably don’t have much time to think about feeding them all breakfast. And let's be honest, making eggs to order isn’t exactly your idea of the perfect Christmas morning. Well fear not— this is what a strata is for! A strata is a breakfast casserole that can be made the night before, stored in the fridge, and popped in the oven when people start to look hungry. It takes the chaos out of making breakfast for a group, and its cheesy comfort is perfect for a cold holiday morning. 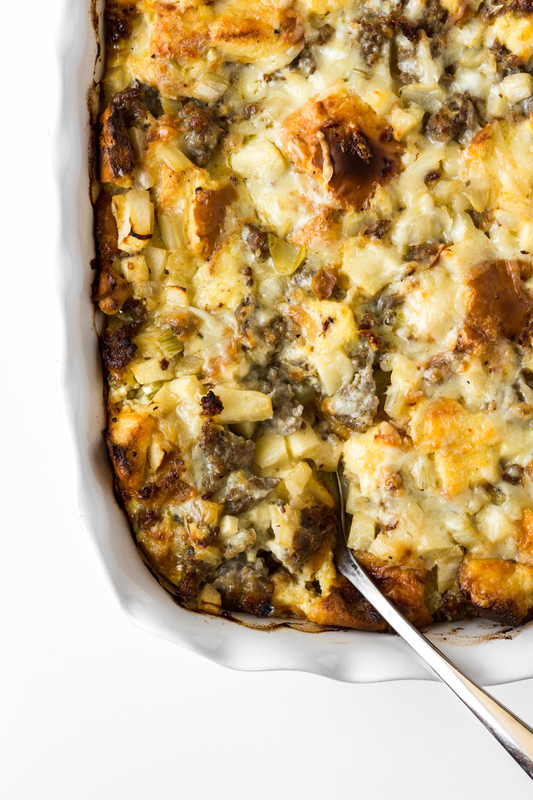 A strata can be filled with whatever your heart desires, but here I throw in diced green apples and fennel for a sweet, tart contrast to nutty gruyere and savory sausage. The brioche is soft and buttery and the perfect vessel for these flavors, but feel free to use whatever bread you need to get rid of (we always have leftovers from our annual cheese fondue shindig). If you do prepare this the night before, be sure to lightly toast the bread so it doesn’t get too soggy, and remove it from the refrigerator 30 minutes before baking. And since it’s the holidays, I hope you’ll serve the coffee with a heavy splash of Irish cream. Merry Christmas!! Butter a 3-quart baking dish (or 9” x 13”) and a large piece of foil. If making the strata for the next day, preheat oven to 250°F. Place bread on a rimmed baking sheet and bake until just barely starting to crisp and brown, 5 to 10 minutes. Transfer to a large bowl. If making strata for that day, transfer un-toasted bread cubes to a large bowl. Heat oil in a large skillet over medium-high heat and add sausage, breaking up with a wooden spoon and stirring occasionally, until browned and cooked through, 8- 10 minutes. Transfer with a slotted spoon to paper towels to drain. Wipe out oil from pan, lower heat to medium and melt butter. Add fennel and season with salt and pepper. Cook, stirring and scraping any bits from the pan, until softened and just beginning to brown, about 5 minutes. Add apples and cook until softened, 3- 4 minutes. Transfer to bowl with bread along with drained sausage and let cool completely. Add all but 1/4 cup of gruyere to bread, fennel and apples, toss to combine and transfer to prepared pan. In a large bowl, whisk milk, eggs, egg yolks and 1 1/2 tsp salt and pepper until smooth. Pour over the top of the bread mixture and press bread down to make sure it’s well coated in liquid. Sprinkle with remaining 1/4 cup gruyere, cover tightly with buttered foil, and let unbaked strata rest on the counter for at least 30 minutes while the oven preheats. If you’re planning on baking it the next day (and you toasted your bread! ), store in the refrigerator overnight. Remove from refrigerator 30 minutes prior to baking. Preheat the oven to 350°F. Bake strata for 20 minutes, remove the foil, and continue baking until the custard is set and the top is browned, another 15 to 30 minutes depending on the depth of your pan. The strata is done when the center doesn’t jiggle when shaken. Remove from the oven, let cool at least 5 minutes, and serve.